China’s role as one of the most prominent world economic powers is likely to remain firm, despite last year’s reports about its faltering economy. It is not slowing growth, high inflation or the reliance on exports that the country should worry about. China’s Achilles’ heel is still its partly clumsy diplomacy and reputation abroad. As the second largest and the fastest growing economy in the world, China’s economic clout on the world stage is undeniable. In the past few years, however, reports of slowing growth and a worryingly high inflation rate have cast doubts on whether China will be able to maintain its upward trajectory in the long-term. The greatest threat is posed by external factors - namely, China’s most important export markets Europe and the United States. Since the global financial crisis took its toll in 2008, the road to recovery in these parts of the world has been long and strenuous. This prompted sceptics to raise concerns over the potentially harmful dependence of China’s export-led economy on foreign demand. But things have been looking up after the decisions by the Federal Reserve and the European Central Bank of 2012, which aimed to further alleviate the crisis. As a result, tensions on the global markets have eased, and China’s recent announcement that it will continue to invest in European debt proves that it will make every effort to revive its largest export markets. “Europe is one of the main markets for China to invest its foreign exchange reserves and China will continue to participate in efforts to tackle Europe's debt crisis through appropriate channels", then-Premier Wen Jiabao said at the EU-China summit in Brussels in September 2012. The agreement between EU and Chinese leaders to avoid protectionism at the Brussels meeting came after a series of trade rows over Chinese trade policies. Shortly before, the European Commission accused China of selling solar panels below cost on the EU market. Judging from what has happened in the last few months, the Eurozone and the United States economy are likely to continue their gradual recovery. Therefore, China should not worry about plummeting demand just yet. Instead, the People’s Republic should reassess the relationships with its most important trading partners. The European Commission was not the only body to accuse China of controversial trade practices last year. The United States launched a WTO appeal against China, stating that Chinese auto and auto-parts subsidies threaten jobs in the US automotive sector. 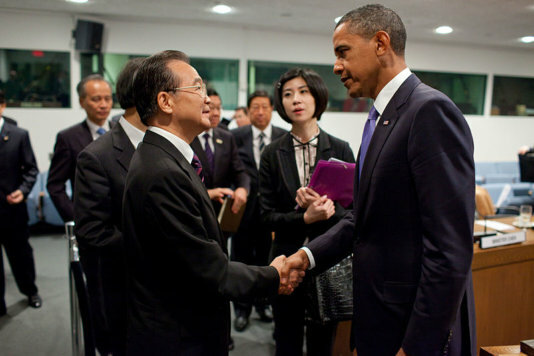 Beijing was quick to respond by filing a counter-complaint against US duties on Chinese exports. Nevertheless, it was the US that emerged as winner of this trade dispute. Despite close US-Chinese trade relations, the countries’ relationship remains strained. A survey published by the Pew Research Center in September 2012, revealed that only 26 percent of the US public thought China could be trusted, and just one-third believed that China considered other countries’ interests in its foreign policy. Clumsy diplomatic skills and the resultant effects on the country’s reputation abroad are the main problems. The Chinese delegation’s appearance at last year’s Brussels summit stressed exactly this point. Journalists at the summit were alarmed after the announcement that there would not be a press conference- alarmed, yet not surprised. Cancelling press conferences in order to dodge unpleasant questions, and trying to ban Chinese journalists living abroad from such events, are not firsts for Chinese politicians. Contrary to the belief of some analysts, successful economic partnerships cannot only be vested in profits. Without trust or productive dialogue, flourishing commerce between countries will be burdensome and difficult to sustain in the long-run. The Guardian- "Solar panel spat threatens trade war between China and Europe"
China in a partnership for peace?